This is one of the first photos I took with my new camera earlier this year. 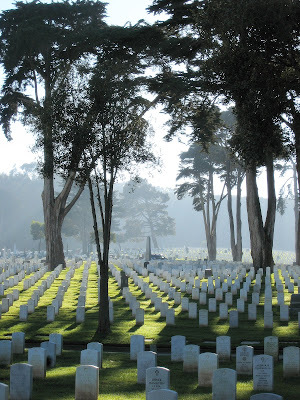 It was over in San Francisco National Cemetery in the Presidio. I wonder why I bother. Why post my photos of the Mission when you can just go and explore for yourselves and see exactly the same stuff? That's really spooky. The authorities are very organized in the Mission. 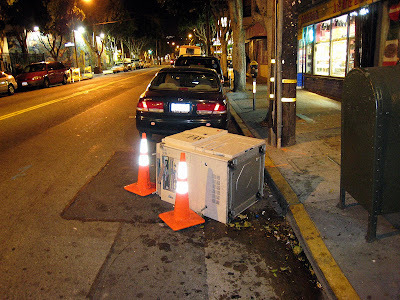 No sooner has someone thrown a photocopier in the gutter than they're coming right round to mark it off with cones. What a place. Also, wanted to share this sight from Mission Street itself. It's Monty Python's "Spam, Spam, Spam and Eggs" done Mission-styleee! Less than three months to the wedding. We started a blog. And now that's out of the way we just need to sort out an officiant, flowers, photos, somewhere to stay on our wedding night... trivia, basically. 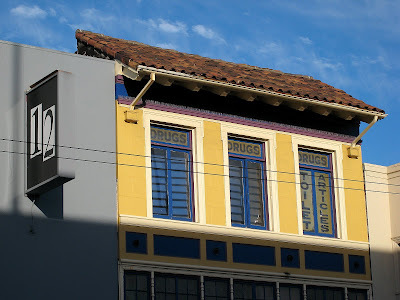 This photo below, which I took on a neighborhood bike ride on my birthday, has finally compelled me to gather up the Mission Colors and put them online. Do not adjust your set; this city is genuinely this colorful! What an amazing place. Factoid #1: on June 25th someone landed on isaach.com having searched on Google for "crazy monky" (sure enough, I'm currently number 13). I go past this sign each time I cycle to work (yes, I do cycle the 42 miles to work once a week). 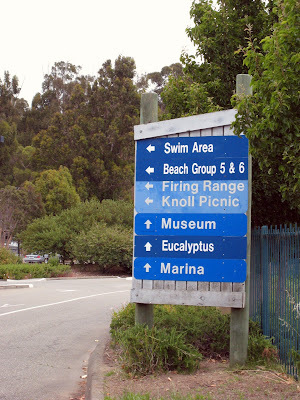 I've always meant to take a photo and post it here... because, well, who *doesn't* like to picnic next to the firing range?